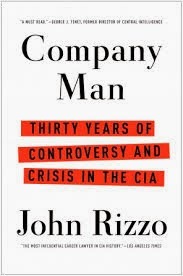 John Rizzo is the author of the memoir Company Man: Thirty Years of Controversy and Crisis in the CIA. He spent more than 30 years as a CIA lawyer, rising to become acting general counsel. Since his retirement, he has been senior counsel at a Washington, D.C., law firm and a visiting scholar at the Hoover Institution. A: I retired at the end of 2009, and I hadn’t really considered doing it while I was at CIA, but once I retired, I realized there hadn’t been a previous memoir by a CIA officer encompassing the period of time I was there. My career, from the mid-1970s to 2009, was on the same arc as the modern evolution of the CIA. I was an observer or a participant in every controversy over those years. A: With people at CIA, it’s been good. A lot of people I wrote about in the book, most have retired, said they liked the book, and they appreciate the way I treated them. It’s been entirely positive. The book is selling nicely. It’s not a blockbuster, but it’s selling steadily. I’ve gotten reviews on some major media outlets—most were good, not all, notably The New York Times. But it did get [substantial space in the paper]—I’m a glass-half-full kind of guy; it’s an important book to devote that much space to it! Q: Did you need to do a great deal of research to recreate some of the events you describe? A: The research was a little tricky. I didn’t have access to any of my CIA files; they were classified. Had I been confirmed [as the CIA’s general counsel], there’s an executive order that presidential appointees confirmed by the Senate can seek access to their records. Since I was not confirmed, I couldn’t [use] that. I went back and read as many books about the CIA as I could. I didn’t do that while I was at CIA; that was the last thing I wanted to do! Former memoirs by CIA directors, and by outsiders. It was very useful. Reading about these events tended to buttress my own reflections. I had a research assistant who pulled off the Internet articles about events like Iran-contra. Beyond my memory, that’s what helped me. Plus I talked to former colleagues. All together, I could put together a comprehensive and accurate portrayal. Q: Was there much that was classified that the CIA wouldn’t let you reveal in the book? A: There was a relatively minor amount of stuff. Every former CIA official is required to submit [this type of writing] for approval. My advantage was that I had written all the internal rules, so I wrote the manuscript with that in mind. I knew where the boundaries were. There were a few things I had to take out—a name here, a paragraph there. This book is about 90 to 95 percent of what I had originally. Q: Why did you choose to begin the book with what you call "The Tale of the 'Torture' Tapes"? A: I wrote the book literally in chronological order, from the first day, and I wrote straight through. One chapter was on the destruction of the tapes. When it went to the publisher, they said we need to start with something contemporary. They thought that was a good chapter to start. It was fresh in the readers’ minds. Then the chronological part [would follow]. Q: You write, "The fact is, the Iran-contra scandal was the best thing that happened to me in my career." Why was that the case? A: I said that. It may sound perverse because the Iran-contra affair was such a huge scandal, with a lot of people caught up in it. Why I said that was that for the first time in my career, I was able to get involved in a major Washington political-media event like that—it gave me a front-row seat to what was arguably the biggest scandal since Watergate. It was exciting. Also, it raised my profile. It was ironic and unfortunate that it came with an event that was so damaging to the CIA. Q: What are you working on now? Are you planning to write another book? A: I actually enjoyed the experience of writing a book. I wasn’t sure I would. I went through a fairly complex process—acquiring a literary agent, picking a publisher—it was perplexing. In retrospect, I enjoyed it. I would like to keep writing. I don’t have a specific book in mind; I’m still in the aftermath of this book. I don’t know if it would be fiction—a spy novel? I can assure you it wouldn’t be a legal treatise! The book is doing well enough that the agent and the publisher think there is a potential audience [for another book]. I have speaking engagements and work at a law firm that keep me busy. A: I was at a book festival in Savannah last month—it was an audience of authors and aspiring authors. I was asked what was the most difficult part [of writing the book]. I said, before I even sat down at the computer, I was hit with the daunting realization that for the first time in my life, I was about to write something that I didn’t know who the ultimate audience was. I realized I was going to be writing for a group of largely strangers. And I was going to write about my own life. That was a big obstacle for me psychologically. The hardest part was starting. After that, it wasn’t bad. The actual writing took me a year and a half. The writing part was the easiest. --Interview with Deborah Kalb. John Rizzo will be participating in the Bethesda Literary Festival, which runs from April 11-13, 2014. For the full schedule, click here.